We like to be in good physical shape to get the most out of our outdoor activities and we particularly dread being cold. We all love the feel good, energising effects of heat, which is also a source of energy. To cater for this desire, we have taken on a “HEAT CHALLENGE” with THERM-IC. To keep our customers warm in a comfortable and healthy environment, therm-ic have focused their efforts on the following process: THERM-IC | THERMO | TRANSFER | TECHNOLOGY. The challenge for Therm-ic products is to keep your entire body at 37°C thus saving your energy for your sporting activities. 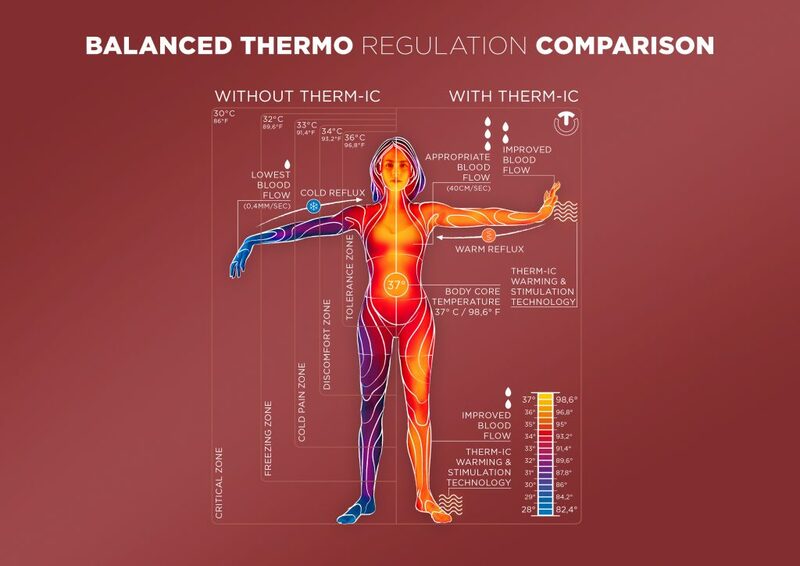 The “THERMIC, THERMO, TRANSFER, TECHNOLOGY” process increases the temperature in critical areas, thus protecting the rest of the body from the cold. Suffer from the cold, or keep warm and enjoy a fantastic day in the fresh air? The choice is yours! Therm-ic has a long history, which began with the invention of heating systems for ski boots. Building on the developments and patented technologies of the last 20 years, our range of products now includes a variety of high-quality solutions in the field of portable heating systems, which are proved to provide warmth. Therm-ic’s products have a variety of benefits, from enhancing human well-being, to significantly increasing an athlete’s performance. Moreover, they have a preventive effect as they reduce the risk of injury. Especially when participating in outdoor winter activities, extreme cold and extreme weather conditions can cause severe discomfort. In the worst case, these extreme circumstances may lead to injuries, frostbites, or cold-related diseases. Our mission is to develop technologies for portable and easy-to-handle heating systems in order to protect the entire body. The product range includes heatable gloves, soles, socks, as well as drying and refreshing systems for the daily shoe care. New are non-electronic warming solutions for everyday life, based on long-term research in insulation and natural heat development. Thus, Therm-ic, the inventor of heating systems for ski boots has now become the warmth specialist for winter sports enthusiasts and everyone who loves the cold season!